The first time I heard anything about La Feria de Abril in Sevilla, Spain, was 4 days before I was scheduled to arrive there. I was traveling through Spain, and when I was in Valencia, I overheard someone on my walking tour mention that La Feria would be going on in Sevilla when she was visiting. My love of authentic cultural experiences forced me to intrude on her conversation and ask her what she was referring to. She seemed to only know a little bit more than me, which was that La Feria (whatever it was) just happened to be starting the day I arrived in Sevilla. What a wonderful coincidence, I now had plans for my few days in Sevilla. La Feria de Abril: What Is It? My knowledge of the Spanish language told me that La Feria was some kind of fair, but that was as far as I got with my research. When I met the friend of a friend whose couch I would be sleeping on the next 3 nights, I asked him if he had plans for the evening. He said, “Yes, I am going to La Feria with some friends from work, and thought you could join us.” Yes, finally someone could explain to me what La Feria was, and take me to this mysterious place. Apparently La Feria de Abril started as a cattle-trading fair in the 1800s and has since evolved into a week-long celebration to help the Sevillanas recover from the madness of Semana Santa, which occurs 2 weeks before. It involves a lot of flamenco dancing, tapas eating, and rebujito drinking (wine mixed with Sprite). 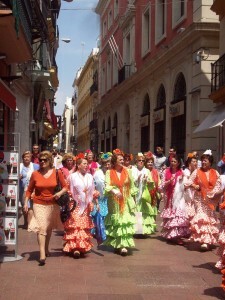 The dresses are colorful and festive and cost at least 200 Euros. The unique thing about these dresses is that their style changes every year. So although it is a traditional style of clothing, the trend still changes, just like any fashion. This is something Sevillanas are very proud of. However, this means that most women buy a new dress every year to stay up-to-date with the trends and only wear it for about a week. They are impossible to bend in, but it doesn’t matter. They are absolutely stunning. The women also wear a big flower on the top of their heads. 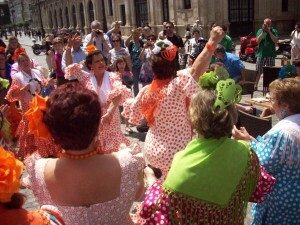 The men wear typical Flamenco outfits, or at least a suit. La Feria is not a casual event; as a backpacker, I stood out. 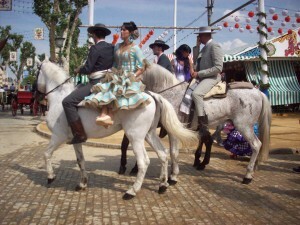 People say that La Feria de Abril is a true example of typical Andalucía, I felt so lucky to witness it. During this week of festivities, an area that looks like unused fairgrounds is transformed into a small tent-city pretty much. There are streets, addresses, and maps are given out to help you find your way around. The gate to La Feria is a big extravagant display of lights and the official lighting of the gate is a big deal for Sevillanas during which people come out at midnight the first day of La Feria just to watch someone flip the switch. Once you enter the gate, you are transported to a world of flamenco. The only mode of transportation is by horseback. Everyone is dressed in traditional flamenco clothing; flamenco music is playing loudly, and everyone is dancing flamenco in the streets. The streets are filled with temporary tents called “casetas,” in which they have food, drinks, and dancing. They are basically little restaurants/bars. Some of these are public, but some require a ticket or a “connection” to get in. The festivities go on all day and night, and most adults are there from about 3 in the afternoon until 6 in the morning. During this time, Sevillanas and others (like me) will caseta-hop, eat, drink, dance, maybe leave La Feria for a bullfight, and then come back. Children enjoy La Feria as well and there is an amusement park with rides to entertain them, you can often find children at La Feria until 4 in the morning (only because it’s La Feria!). I am so glad I got to experience La Feria. 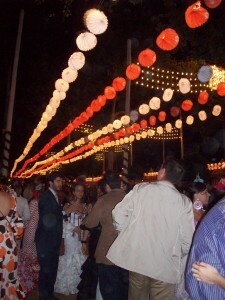 The first night I was in Sevilla, I went to La Feria with my host and met his friends. Most of them were dressed in suits and flamenco dresses. We went to one of the exclusive casetas because they had a connection. A few different people taught me flamenco dancing, and as we caseta hopped all night, I continued trying to master these beautiful movements. All around me arms were swirling in the air, and skirts with flowing, along with the rebujitos and tapas. Sevillanas learn flamenco at a very young age; the way we take gym class as children. 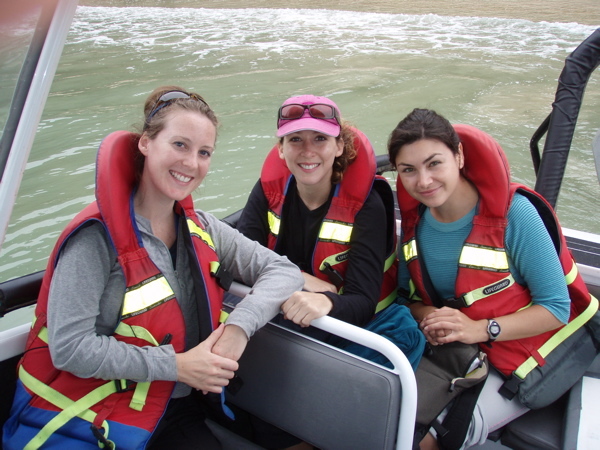 Almost everyone knows what he or she is doing and is happy to teach those who don’t. They included me although I wasn’t dressed appropriately, my Spanish was not perfect, and I was stepping on their toes, literally. Everyone was happy–these were my best friends for the night–but the bond of La Feria is long lasting. The overall feeling was (I hate to say it) jolly, there is just no other word to describe it. The next night I came back with some friends from Canada who were also visiting Sevilla. They met a guy on a train who was from Sevilla and he invited us all to his private caseta with his friends and his family. So at 5 p.m., we entered the gates, looked up his caseta address on our map, and made our way. We got past the bouncer-esque men with no problems and I spotted a beautiful Spanish man from far away. Luckily he was friends with the guy who invited us, and, needless to say, a 12-hour romance sparked between us. Something about Sevilla during La Feria makes you feel like you have been put under a spell. The flowing skirts and the sexuality of flamenco create this dreamlike atmosphere and I lost all sense of reality. My Latin love interest and I were together from 5 p.m. until 5 a.m. During our final moments, we did not exchange any information but we decided to meet in the plaza outside of the cathedral the next day at noon. Without any doubts, I was out the door by 11:30 the next morning. Of course, I missed my stop on the bus and the next one was extremely far away. Panicking, I jumped in a cab and went backwards. I willed the traffic to disperse and arrived at the cathedral only 15 minutes late. I looked around and after no sight of him, I parked myself on a very visible bench. My head began to spin; no one would only wait 15 minutes right? That’s when the spell started to fade. 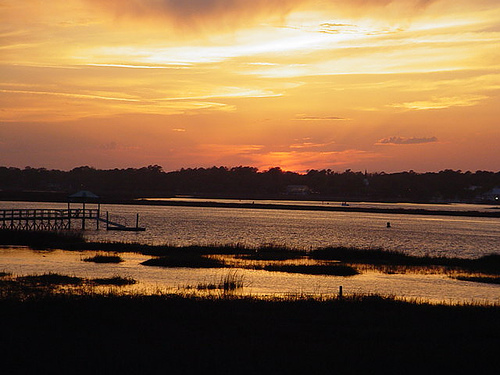 My normal pessimistic thoughts started to resurface, thoughts like: “what am I doing here? There is no way he is actually coming! I cannot believe I really thought he was!” It truly made me laugh. On a normal day at home in NYC, this encounter would never happen. And if it did, meeting him would have been out of the question. In real life, I’m crazy about safety and being realistic, and meeting up with him went against both of those traits. I still sat on the bench until 1 p.m., by which time there was no sign of my potential Latin lover. Pretty disappointed, in him and in myself, I got up and went on with my last day in Sevilla. I will have you know, being stood up in Sevilla did not ruin my time there. If anything, it made my visit more interesting and memorable. I usually never let my guard down, I never give into passion, emotion, and magic, but as soon as I walked through the gate to La Feria, my personal gates collapsed so that La Feria could swallow me whole. I still made sure I was safe at all times, but I allowed myself to embrace the culture of Sevilla by mingling with the people and feeling the passion and love the Spaniards have so much of. I was really proud of myself actually because for two days, my life was unpredictable, romantic, passionate and exciting. I wouldn’t change a thing.